Karaokespelare VS-1200 HDMI, HMDI, CDG, DVD USB mm. 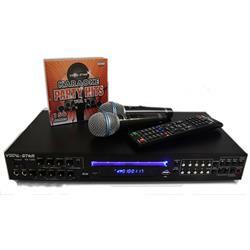 New Vocal-Star VS-1200 HDMI Pro Smart Karaoke Set is the most advanced Karaoke Player Worldwide. It combines all of the features you would expect from any Vocal-Star Karaoke Player, with some groundbreaking features that will amaze. The VS-1200 was the World's first Bluetooth enabled karaoke player, allowing you to sing songs from the internet via a phone, tablet or laptop. Introducing the Most Powerful Karaoke Player ever seen since the start of karaoke. • Load and play Songs from discs in under 10 Seconds. • The VS-1200 is also the world's fastest high speed CD+G to Mp3+G Ripper - copy your CDs and Karaoke CD+G direct onto USB Or SD Card and play back instantly. • Record your singing from songs on SD USB and CD+G and play them back using a usb stick or SD Card and watch back with the words displayed to see if your in time. • Has a Scoring Function - Let Vocal-Star score your singing! • Recording Studio- Raise or lower the music volume to suit your voice for perfect Recordings. • Play Last Recorded Track - Leaving more time to Sing & record! • Print your Song List- Automatic A-Z & Numbering Songs stored on USB or SD Instantly ,Creates a file to print and hand out to your friends & family. • Full Screen Jukebox -Just Punch in the number or Search Songs by name or number quickly . • Direct track access from the front panel on the player. Play tracks via your devices with Bluetooth. You can even sing along to music and karaoke on the internet giving you access to millions of music and karaoke via websites like YouTube. Record your singing from songs on your phone, tablet, laptop and even straight from the internet. Record your singing and speeches with a push of a button. The Vocal-Star Karaoke Machine will record your singing and the backing music together - making your very own music track. This can then be transferred to a computer to burn onto a disc or even share with your friends on social media websites. You can also record your singing with your normal CDs too, allowing you to duet with your Icons. Also records with lyrics displayed on playback (MP3G) so you can check your timing. Will you have the vocal ability of Adele, Lennon or Beyonce? Or will your performance be worse than an X Factor Wannabe? The Vocal-Star Karaoke Machine will be the judge of that ! Enable scoring mode to rate your performance - ideal for parties and gatherings. The Vocal-Star can copy any CD+G (Karaoke Disc) or normal CD onto a usb stick or SD Card. This is ideal for storing all of your favourite songs into one location and play back quickly with the Vocal-Star. The Vocal-Star, unlike most budget players around today will play pretty much all karaoke discs ever made and support mp3+g karaoke downloads too. You won't be restricted by a poor selection of songs with this machine. Check out our store for thousands of compatible karaoke discs to play on your new machine. The Vocal-Star allows you to change the tone of the track you are singing Choose between Rock, Classical, jazz and Pop settings for incomparable vocal options.And with the ability to change the music volume when recording to suit your voice for the perfect recording. When you store your songs on a compatible storage device, you can display a list of all of your tracks on screen and select the song you want to sing Just punch in the song number or search by A-Z. You can even organise your karaoke tracks into custom folders such as "Joes top 80’s Hits" or "Gills favourite songs" to make finding your tracks even easier. 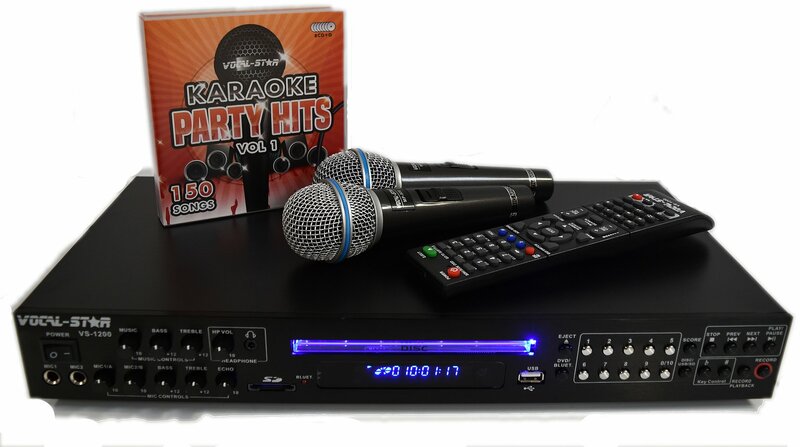 Vocal-star have make storing, selecting and playing your favourite karaoke tracks even more fun! Will also sort your songs from a storage device into A-Z and create a file so you can print out song sheets for your guests. The Vocal-Star has added a top of the range Pro-Digital 13 Step Key change facility to allow the user to change the pitch of the song you are singing. Lyrics Displayed On Your T.V. Lyrics are displayed on your screen and change colour to prompt you to sing. The Vocal-Star, unlike any other Karaoke Player has been designed for Karaoke only and crisp, clear vocal performances are very important to us. Carefully chosen and tested parts are used meaning, in our opinion, with Vocal-Star you get the best Karaoke sound in the World. Setting up your brand new Vocal-Star is as easy as it gets. Red, White and Yellow RCA cables are supplied to connect to any television, It couldn't be easier! You can even connect the VS-800 with a HDMI Cable. The VS-1200 Has a Headphone Jack Built Into The Front panel , Sing & Listen To Your Song In Private, You can also Listen To Your Movies In Private Too. Introducing the World’s most powerful karaoke player ever seen since the start of karaoke, constructed from the finest vocal components in a robust metal casing. World Firsts for the VS-1200 include playing tracks via your IPod, Tablet and Laptop. You can even sing along to music and karaoke on the internet, giving you access to millions of music and karaoke via websites like Youtube. Record your singing from songs on SD USBand CD+G and play them back using a usb stick or SD Card.and watch back with the words displayed to see if your in time.